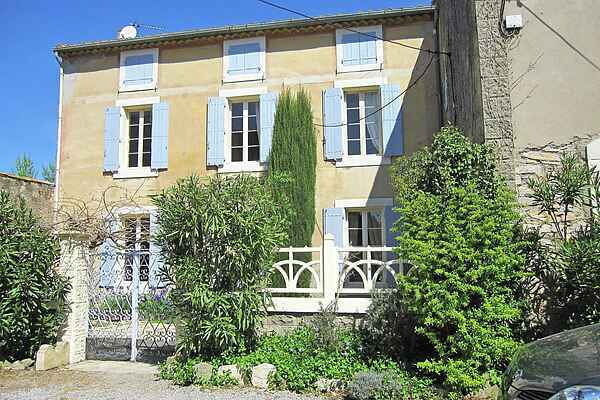 This beautiful 'Maison du Vigneron' is situated in the authentic village of Sainte-Valière and is perfect for a wonderful holiday. At the house you have a walled garden and a private swimming pool (8 x 4 m, depth 0.80 - 1.80 m) where you can swim in total privacy. The village of Sainte-Valière is very conveniently situated. You are near charming seaside resorts Narbonne-Plage (29 km) and Gruissan (41 km), as well as some beautiful cultural sites. We mention the castle town of Carcassonne (43 km) and the Cistercian Abbey of Fontfroide (24 km). Sainte-Valière is just 3 km away from the Canal du Midi (a UNESCO World Heritage site). This famous canal connects the Atlantic Ocean with the Mediterranean via Toulouse. It is wonderful to walk and cycle along the canal (lots of lovely restaurants on the way!). After a long cycling trip you can go towards the bathing beaches at Bize-Minervois (8 km) or the lake of Jouarres (15 km). Have lunch on any of the shaded squares in Narbonne (20 km) and then visit the archaeological museum, with treasures from the Roman Empire. Bicycle and boat rentals at the marina in Capestang (19 km). Canoe rental in Cessenon (34 km). Tennis court and groceries in Sainte-Valière. 18-hole golf course in Beziers (35 km). Nice looking house with a lovely, covered terrace and a well-equipped outdoor kitchen (BBQ and fridge). The detached mansion has high ceilings, original tiled floors and spacious rooms. Living room with sitting area, TV and DVD. Dining room. Separate kitchen with dishwasher, microwave, and fridge freezer. Separate toilet. Upstairs: Bedrooms 1 and 2: each with a double bed. Bathroom and shower. Bedroom 3: a wide single bed (1.20 m) and a bunk bed. (Second) bathroom with bath and (second) toilet. Second floor: Bedroom 4 (very spacious): a double bed. Washing machine.